Cute pattern of a puppy and text "Home is where I am"
Funny cross stitch of the penguin Tux, official Linux mascot! Everyone seems to love juicy watermelon in the summer! 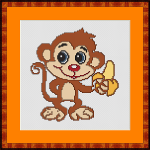 Cute monkey holding a banana, designed in a cartoon-like style. Small cross stitch pattern of a witch riding her broom. Great for card-making projects, small pillows or mini biscornu. 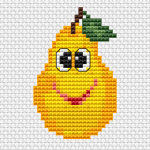 Cartoony cross stitch of a smiling pear.The pattern contains bright, cheerful colors,full stitches and backstitch. 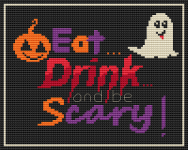 Funny Halloween party cross stitch pattern :"Eat,drink and be scary!" 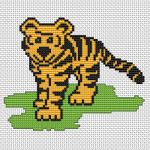 Cute cross stitch pattern of a tiger cub. Great for kids and animal lovers. Cross stitch pattern of a pair of delicious cherries showing opposite emotions.Suitable for decorating children's clothing. Pattern of an owl for your Halloween cross stitch projects. Funny and colorful pattern of a kitten, with text "Loved by a cat". A great bookmark for kids and cat-lovers.